Findremix has teamed up with label Outpost Records to bringing you the chance to remix another top producer: Lars Sandberg AKA Funk D’Void! 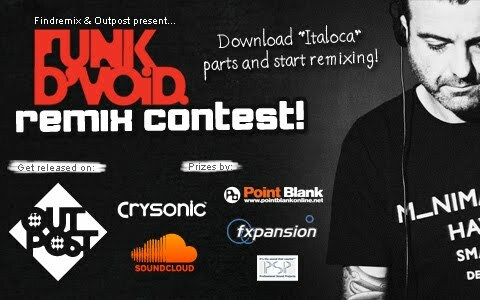 Download “Italoca” parts and start remixing! Make sure you become a fan of Funk D’Void on Facebook in order to get qualify to this contest. Grab the stems below, let your studio creativity loose and send us your rework for a chance to secure some awesome prizes from Outpost, Crysonic, Point Blank Online, SoundCloud, FXPansion and PSP Audioware. Closing date for submissions is May 31st. Step 2: Write a comment at here telling the findremix guys that you are in! Step 3: Download the (wav aif) samples here or use the player below.